Long ago, a goblin caught sight on himself in a reflection. Frightened so much by what he saw, he vowed never to show his face again. He spent many years alone. But then he saw a farmer stop chopping wood, sigh and put his face in his hands. The goblin went to work that night and though he tried not to be seen, the farmer saw him. The following day on the same farm, the goblin saw a woman stop gardening and put her face in her hands. That night the goblin again worked on the farm and though he tried to be careful, the woman saw him. The next day, a child on the farm put down her book and buried her face in her hands. That night, the goblin soothed her and sat with her and though he was careful, the girl saw him. The next morning, the family gathered for breakfast at a table with one chair that had been empty all winter. They left the door open for the goblin to come in and fill that empty chair. This book told is an original fairy tale by one of the world’s top story tellers. Mem Fox has created a sympathetic character in a goblin, which one would not expect. Her skill at the fairy tale format with its repetition and spare style is masterful. She has created a story that is open wide with opportunity. There is space here for haunting, for fear, for spine tingles and for a happy ending. 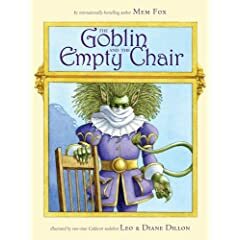 Leo and Diane Dillon took that opportunity and created a goblin that is graceful and princely, with large ears and flowing green hair. Readers never see the goblin’s face, making him more of a tragic hero than a monster. There is a touch of the Beast in Beauty and the Beast here, speaking about the quality of the internal rather than external. A highly successful collaboration between a master storyteller and master illustrators. Appropriate for ages 4-8. You can listen to Mem Fox read the book here. When you meet a bear on Broadway, you stick out your hand and ask them to stop. Then you politely ask what his business is there. He bursts into tears saying that he has lost his mother. The two of you think of how to find her together. Then you look uptown. And downtown. Along the river. Until you find a forest where the bear climbs a tall tree and shouts for his mother. But will a mama bear be able to hear him in the middle of a bustling city? Though the styles are very different, this has the feel of Laura Numeroff’s If You Give a Mouse a Cookie feel. It is the short lines and the repeating phrase of “When you meet a bear on Broadway.” Hest takes this form and creates a book about being lost, being helped, and being found. There is never any sense of panic about the child helping the bear. It is far more of a problem solving book about what to do when you find a bear on a city street. The book has a nice bit of old-fashioned whimsy about it though the setting is modern. Savadier’s illustrations contribute to this with their gentle lines and watercolor washes. The little girl and the bear are often the only bright color on the page, magnifying their relationship rather than the largeness of the city itself. Funny, quiet and very satisfying, this book would be nice paired with any of Numeroff’s If You titles. It also offers a nice change of pace for any bear-themed stories. Appropriate for ages 3-6. Also reviewed by A Patchwork of Books.